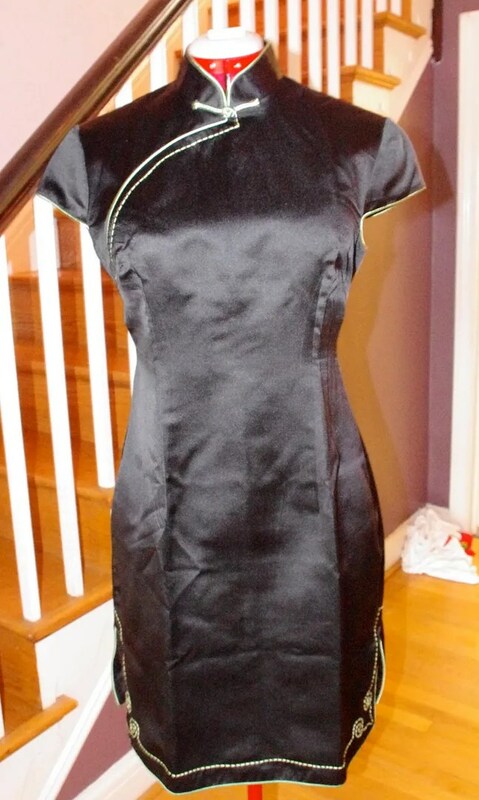 At first, while fabrc shopping, I thought I would get my own fabric and make a ‘qipao’. But, I realized I didn’t want to be decked out in all embroidery. I thought I would look like a hummingbird. But, Helen and I saw these two beautiful, simple, classic designs that I started thinking maybe I would get them made. When I was told each dress would be about $45 I realized it could be years before I got around to making one (and really. was I seriously going to make a traditional Chinese dress??) and I might as well give it a go. When they told me it would be ready the NEXT day, I was sold. They took just a few simple measurements and asked how tight I wanted it. I told them loose figuring it was better to have have it taken in later (which I did in Xiamen) rather than struggle with a dress that was too tight. Helen and her husband picked my dress up for me and delivered to my hotel since I had meetings that day and they thought the 50 RMB delivery fee was too high. For this dress, I had them move the side slits to a CB slit. One of the things I found frustrating about China is the bargaining and ripping off of foreigners. 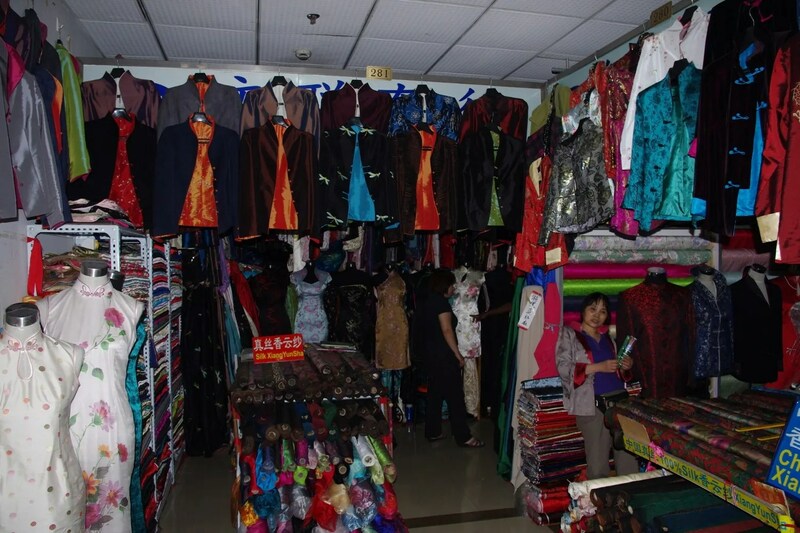 In Xiamen the first tailor (admittedly at the hotel) wanted 400 RMB to take in my two dresses. The dresses cost 650 RMB. 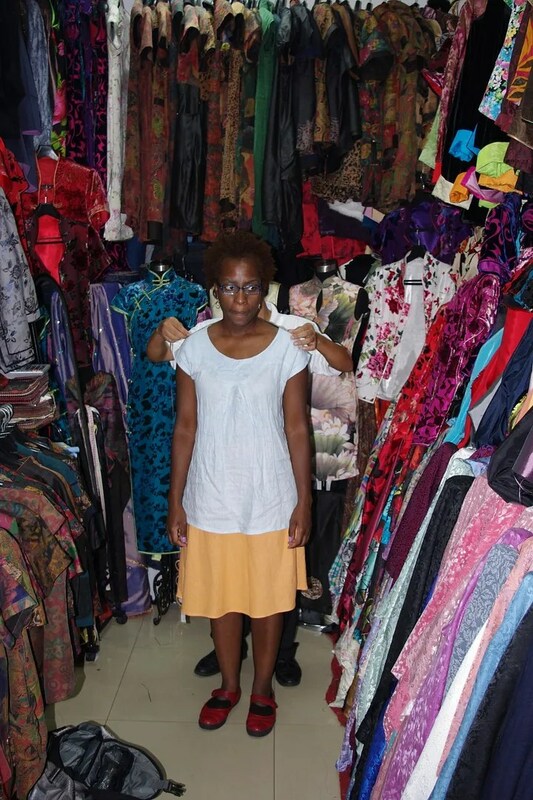 The next tailor I found in the garment area? 40 RMB. About $5. Isn’t that some BS? I’m currently not a fan of sheath dresses on me. I’m too bottom heavy for it. But, I couldn’t resist this simple design in black. 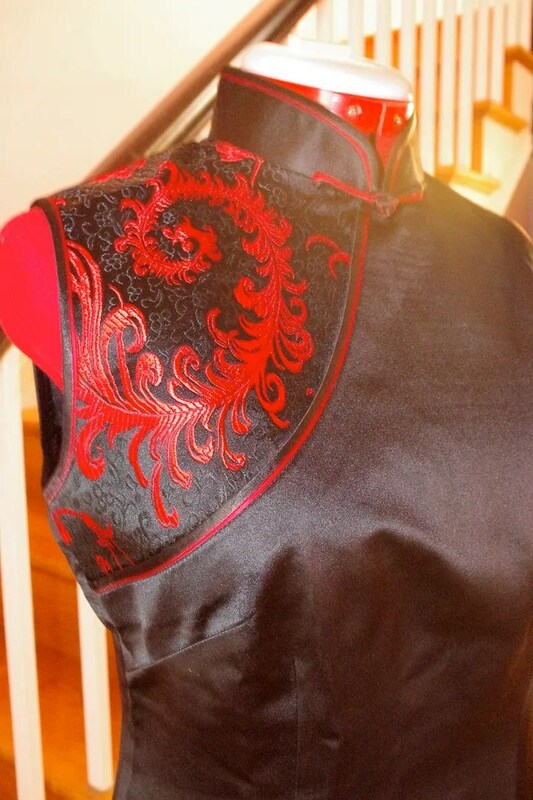 The red insert is a phoenix which is the symbol of the empress. I was born in the year of the dragon and figured that design was what I wanted. But was told by everyone that dragons are for men. Did I mention I only took one pair of shoes with me to China? Try not to shake your head at me. I did buy better shoes for the the second time I wore this dress. The second dress was actually the first one that caught my eye. All the topstitching in hand done. The cap sleeves are a bit limiting, but I love, love the color combination and fit. 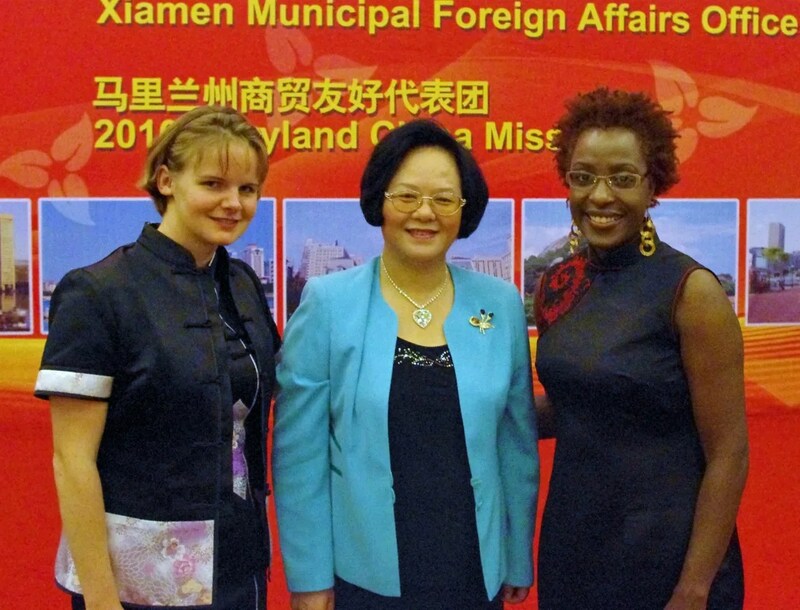 Elizabeth had her dress made in Xiamen for about $30 for dress and jacket (not including fabric). Hers took four days to make. It took a great deal of self control and FABRIC choice overload to prevent me from having another two made while we were there. 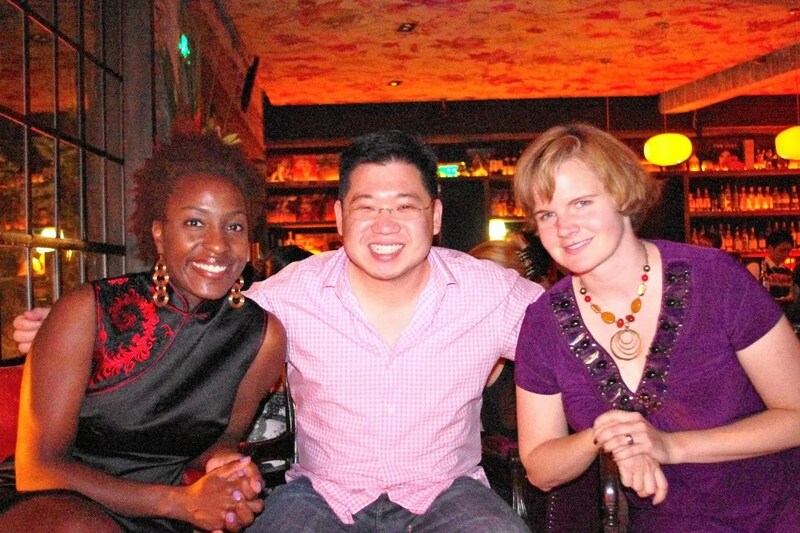 Here it is at my BEST dinner in Shanghai at Lost Heaven with our friend Fred. Have I already mentioned how great it is to have friends all over the world? Shanghai couldn’t have been easier to navigate thanks to Fred and Helen / Hai. I think, if I lived in China, I would sew far, far less. The finishing techniques used I aspire to. The speed of garment production and the cost would really make sewing my hobby versus my primary way of clothing myself. If you can ever have something custom made (and not by you!) I highly recommend it! I love, love, love my dresses. Gorgeous, both dresses. And you look very beautiful in them! Thanks for sharing your trip with us, it’s great to read. Loooove that dragon dress! You’re totally right not to worry about the dragons for men thing, I have a friend who’s a dragon but a Chinese girl too, and says she got harrassed during her whole childhood about it. Sheesh. Being sewn for is utter pleasure. 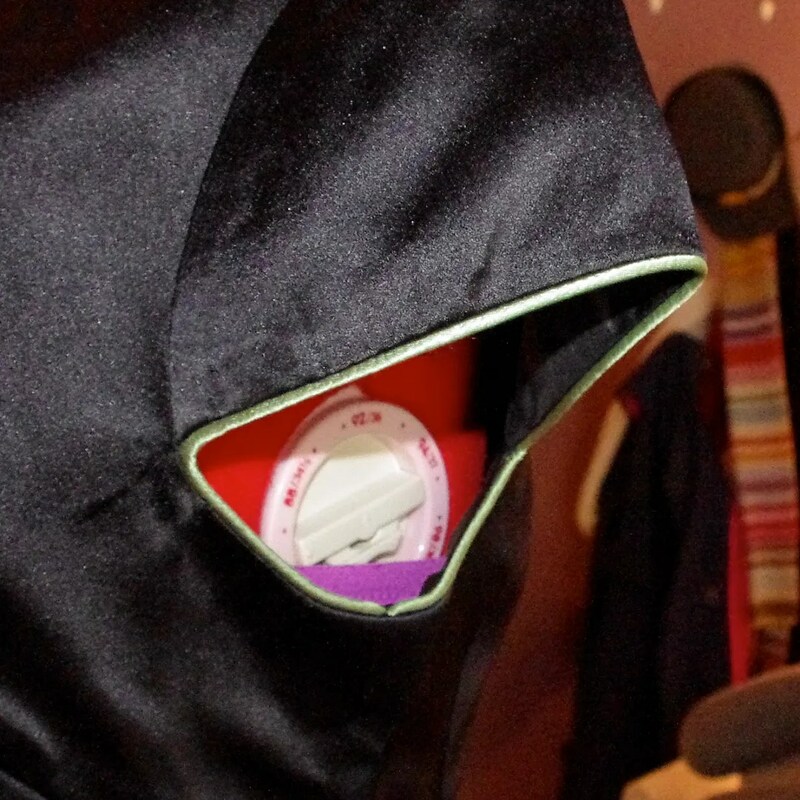 I try to sew for other seamstresses, because they’re the ones who appreciate it most. Wow! What a fantastic souvenir! So much better than old-fashioned tourist tat. I also feel a little bottom heavy for sheath dresses, but I think you look nice in yours. Not at all bottom heavy. Both dresses are gorgeous and, oh, that topstitching on the 2nd one – wow! I think the qipao is very pretty on you, really shows off your curvy shape. Love your dresses! Done in a day. How incredible! I would love to sew that fast. I think they look great. You should not fear a sheath if it’s that well made. Fear not the sheath — you look fabulous in that dress! Your shapely curves are perfect for that style. 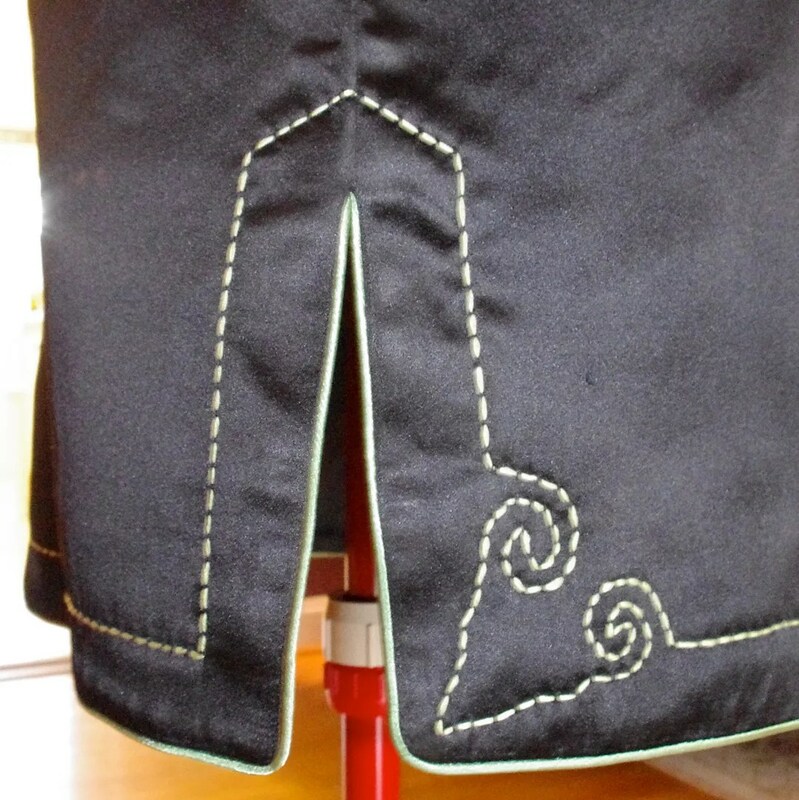 The trip posts are fascinating — thanks for sharing the non-sewing bits, too. Lovely dresses! I have had suits made when in HK and the work is beautiful. It is amazing how fast they are! C – I love both dresses on you. I don’t think you are bottom heavy for the dresses at all. The focus on the dresses are on the neckline and that’s just fantastic. I hope they told you that the dragon and the phoenix combined make for a happy relationship/marriage :-). LOL they sure do know how to rip off tourists but I anm very happy you had your friends guiding you. It’s all about haggling. Girl, the Caribbean side of you should have popped out when it came to haggling. I know it does in me. Much love and again, you look FANTASTIC!! Both dresses look gorgeous and they are very flattering on you. They fit well. What a trip! The fabric choices are beautiful! DH bought me a ready made dress in Singapore that while beautiful in style, impractical in fabric choice and I’ve never worn it. I feel like him sending back out to sea to buy me some like yours! What an amazing trip. Thank you so much for sharing with us. The dresses you had made are truly beautiful and look great on you. Looking forward to seeing what you create with the fabric you brought home – if you are like me, I have to let it sit in my fabric closet for awhile while I ponder the possiilities. Thanks again. I’ve enjoyed your posts on China. Wow, that dress with the red shoulder embroidery is *amazing* on you. Just gorgeous. I like the other dress as well. What an opportunity!! Goodness, I can’t keep up with your blistering blogging pace! Love your dresses. The decorative hand-stitching is insane. ONE DAY???? Wow. Beautiful! On the first one I love how the detailing is all on the shoulder area, so pretty. How amazing that a dress can be custom-made in a day! You look simply fabulous in those dresses! What a treat for you, and what a treat for us to live vicariously through you! Your dresses are gorgeous! This is why most people here think I am totally crazy for making my own clothes! If I had had one more day in Shanghai, I was definitely going to have a trench coat made. After going in through Shanghai, I’m pushing for a HK layover if there ever is a next time! Especially since neither one of us thought that much of Beijing. HK would have been a better way for us to go. Your dresses are beautiful. Particularly like the embroidery on the second dress. You will look great in sheaths. You are a classic hourglass. Thanks so much for sharing all these posts. I love following your site and I’m going to stop over in Shanghai for a few days on my way back to NZ at the end of Dec. Hopefully I’ll manage some fabric/notion and dress buying. Would you recommend your dress makers? Just beautiful, both of them. I think you would have been crazy not to have had them made – due to the price and the construction. I remember reading an article a few years back in Marie Claire or something about a writer living in either China or Vietnam and her experience with the custom clothing business. She had a ton of beautiful stuff made (she’d rip out designs from magazines and they could knock it off like that), but said that the trade off was the constant criticism of her body by the tailors- too fat, hips too large, etc. It was a very interesting article. I’m guessing the folks in the mall were a bit nicer than that. Both dresses are lovely but you should not worry about either being a sheath. Because they are on the looser side, they really look very nice on you. I love the one with the phoenix. I cannot get over how reasonable they were. You are NOT bottom heavy, but a classic hourglass and look lovely in both dresses.